Elizabeth Herkner wears a jumper decorated with small buttons over a blouse with gathered sleeves and neckline. A string of pearls is worn high on her neck over a dark turtleneck-style collar. Her hair is cut quite short on top, but her long braided hair falls over her right shoulder. Cabinet Card, 5 1/2 X 4 in. Title by cataloger. 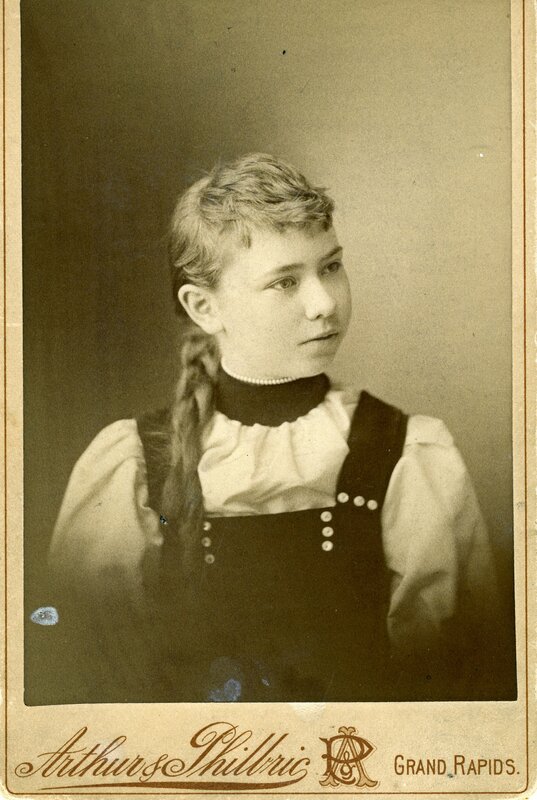 Elizabeth Herkner, born 1872, was the only surviving child of Joseph Herkner and Clara L. Calkins. A daughter and son died in childhood. The photo is dated by the years that Arthur & Philbric appear in Grand Rapids City Directories.